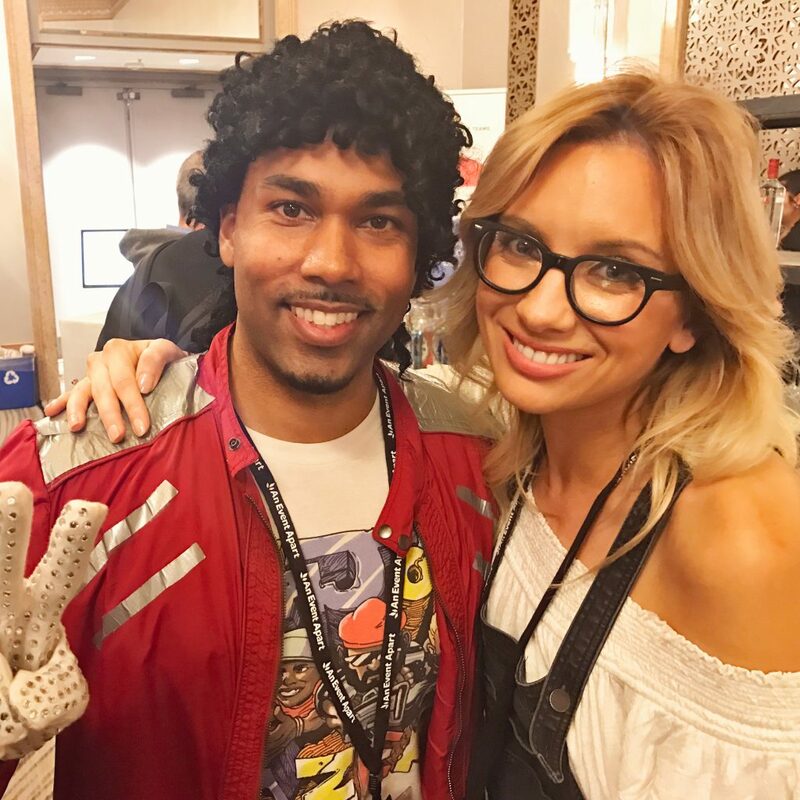 Come to AEA, and you might be lucky enough to meet MJ himself. If you’d like to come along, I’ve got a discount code that will get you a cool $100 off the ticket price. Just use the code AEAPARM to redeem at the checkout. I make no secret that speaking at An Event Apart is one of the highlights of my year. I still feel incredibly lucky to be up on stage amongst all the other smart-as-heck speakers. 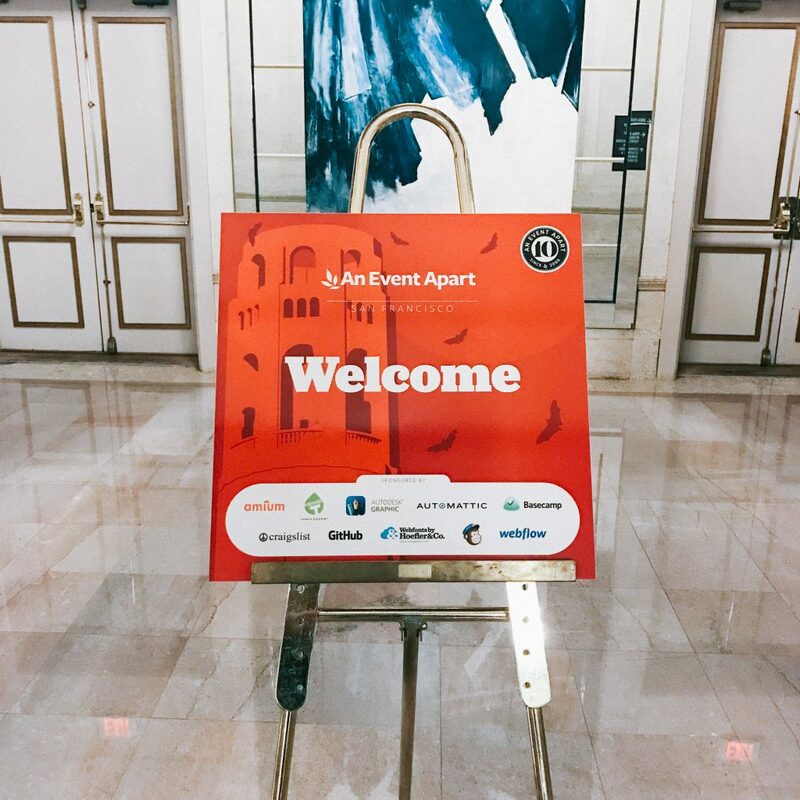 If you have never been to an AEA event, you probably don’t realise some of the surprising differences between AEA and the web conferences you’re probably used to. It’s run with crazy precision. There’s no fumbling of tech equipment from speaker to speaker. It starts at 9 am and at 8.57am you can find Jeffrey or Eric on stage giving you some housekeeping notes, ready to hand over to the first speaker dead-on 9 am. Breakfast, lunch and snacks are all provided for you. Breakfast is awesome and a nice time to get to know some of the attendees. Everyone is really friendly, and the conference has purposely designed ice-breakers to help you strike up a conversation with other people if you’ve come alone or find social situations with strangers a little hard to crack. Happy Hour straight after the conference on Monday with sponsor themed cocktails. I don’t need to say any more than that. The sponsors are carefully curated; the stands that you will see in the foyer of AEA are all things that genuinely peak your interest. For the talks you will sit at a table, where there is a power socket for all your electronics. It’s not just socially acceptable, but you’ll actually be in the minority if you’re not sat there tapping away taking notes or sketchnoting (that’s become an awesome trend recently!). The slides of each speaker are provided for you in advance. It goes back to point number 1 – crazy precision. Diverse and curated speakers. It’s one of the only conferences I know of that not only sometimes has a 50/50 ratio of male to female speakers, but is also racially diverse. Each speaker is carefully selected and their content specifically chosen. The speakers also have a genuine want for you, the attendee, to be able to take home as much information as you possibly can while also filling that inspiration phial up to brimming. We often sit in each other’s talks, especially the first talk of the year or a new talk, and make notes on crossovers or who to listen out for that will be going into a touched-upon subject, in more depth. It’s one of the things I hear the most when I’m speaking to attendees; they often think we all rehearse together before the actual event. AEA as a company respect their speakers, and in turn, their speakers pull out all the stops for them. It’s baked into the fabric of AEA that the bar is high. AEA treat their speakers very well, with a high emphasis on personal safety which in turn creates a reciprocal-huggy-work atmosphere where everyone is happy and wanting to do their best. I’d love to see you at AEA in 2017, be sure to tweet me and let me know you’re coming. Previous Post America, here is why I love you.